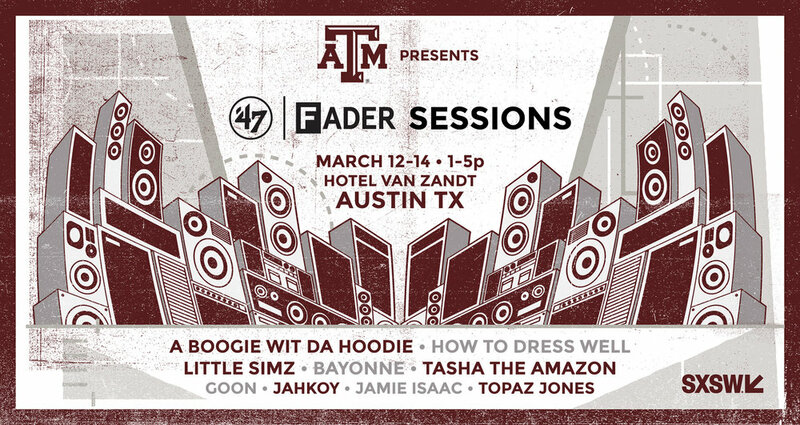 SAMO worked with 47 to enhance the visual stage experience of 47xFader Sessions presented by Texas A&M at SXSW. SAMO created custom animations for each headlining performance to create a distinct visual pallet for each artist to thrive in. He operated visuals for the 3 day event by live mixing loops, applying effects, and audio reactivity to the performances all in real time. The stage was composed of a single channel rear projection screen, simple LED stage lighting, 47xFader Session cubes, and an assortment of music based paraphernalia that all came together to resemble an intimate club-like look and feel in a hotel conference room of Hotel Van Dandt. Each headlining performance was video recorded and edited to create motifs in order to share to the internet audience and spread more discovery for the artists. Performances by Bayonne, Little Simz, Jacob Banks, A Boogie wit Da Hoodie, and more.